There are three types of buttermilk: traditional buttermilk, cultured buttermilk and acidified buttermilk. In terms of making buttermilk, as a quick (good) working substitute for shop-bought buttermilk, we recommend making the acidified version. However, we also give a cultured buttermilk recipe below if you want to make more of it more frequently. Traditional Buttermilk is the by-product of butter-making, the liquid which is left over after butter is churned from cream. Cultured Buttermilk is commercially made by adding a bacterial culture (lactic-acid bacteria) to skimmed milk (this is usually the one available in the shops). Acidified Buttermilk is a small addition of an acid (like vinegar or lemon juice) to full-fat milk. Traditional recipes calling for Buttermilk should use the commercial cultured or traditional buttermilk, when it is available, and when you have time to procure it, or make it (see below). This is when an amount of lactic acid develops in the milk, which is produced by bacteria fermenting the lactose, making buttermilk thicker than plain milk, cream coloured, and more tart; and well on the way to becoming clabber. However, if you need to make your own buttermilk quickly, the acidified buttermilk is an excellent substitute. The cost of buying the distilled vinegar is about the same as buying a small carton of cultured buttermilk, while the bottle of vinegar will be able to make many litres of buttermilk, and the vinegar can last in the store cupboard many months for the times when you need to make it. In making our own buttermilk quickly all we need to understand is that the tartness and thickness of buttermilk is due to acid in the milk, so all we need to do is introduce a natural acid into normal full-fat milk – which thickens it and produces the natural tartness – which is why making a quick buttermilk only takes two ingredients, milk and distilled vinegar, and just twenty minutes later it is ready to use. For every 100ml of full fat milk you pour into a jug stir in 20ml of distilled vinegar. Leave it twenty minutes, stir, then use. It can be left over-night in the fridge, which thickens it more. Here we are going to make a cultured buttermilk, which when fully developed is also known as a traditional “bonny clabber” (bainne clábair). Clabber: is when unpasteurized milk, due to bacteria (lactic-acid bacteria) turns sour and thickens – over time, the milk thickens or curdles into a yogurt-like substance with a strong, sour flavour. Each time we clabber the milk for the buttermilk starter it should take a shorter and shorter amount of time, from several days to just 24 hours. If you can get fresh unpasteurised milk (and you know the risks) you can use this instead of shop bought pasteurised milk – and then you will not need the shop bought cultured buttermilk. You can also get traditional buttermilk from making butter with an unpasteurised double (heavy) cream. Making the buttermilk starter: In a sterilized (and cleaned-rinsed) glass jar which can hold 600ml (1 pint) or wide-necked bottle which you can seal, add 240ml of fresh milk, with 240ml of cultured buttermilk, seal the jar and shake. Allow the milk to sit at room temperature, and leave until it has clabbered (usually several days). Once clabbered pour off half of the thickened milk and keep the remaining half in the jar. Add 240ml of fresh milk, seal the jar and shake to mix, allow to sit at room temperature until this milk has clabbered. Repeat the process. Once clabbered pour off half the clabbered milk and keep the remianing half in the jar. Add another 240ml of fresh milk, seal and shake to mix. This time the milk should dependably clabber in 24 hours or under. Taste a small amount of this cultured buttermilk to confirm that it is now tart (acidic) and thickened, and importantly has no off flavours – it should not taste bitter for example. This is now an established buttermilk starter or inoculum. 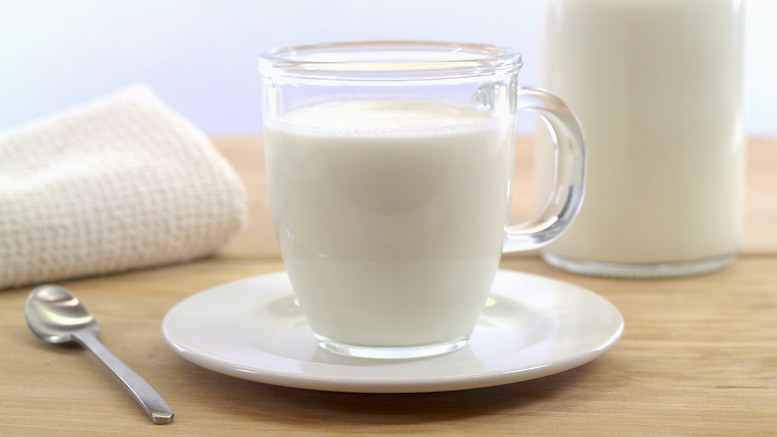 Making the buttermilk: To make just over one litre of buttermilk add about half (200ml) of the buttermilk starter to a large 1.2 litre jar, sterilized (and cleaned-rinsed), fill with 1 litre of fresh whole milk – cover or seal and shake to mix. Allow this to sit at room temperature until thickened and soured. Then refrigerate and use as buttermilk when needed over the next three or four weeks. The remaining buttermilk starter can also be refrigerated and maintained/refreshed – use it to make more buttermilk. However, because the desired bacteria may have died in older samples, a buttermilk starter older than four weeks (which has not been refreshed) may not work as an inoculum to make more buttermilk. Note: a mould may develop on the inner walls of a buttermilk jar if left for several weeks unused. This mould comes from the same group of fungi which naturally grows on cheese and it is not harmful. Remove the buttermilk, and clean the jar, and the buttermilk can still be used for baking.